The surgeons of the 4077 deliver even more hilarious hijinks on Blu-ray! Starring Donald Sutherland, Tom Skerritt and Elliott Gould, M*A*S*H focuses on three American army surgeons stationed in Korea during the war. Though highly skilled and dedicated, they adopt a hilarious, lunatic lifestyle as an antidote to the tragedies surrounding them in their Mobile Army Surgical Hospital. Robert Duvall, Gary Burghoff and Sally Kellerman also st.. Hailed as one of the best comedies ever made and nominated for 5 Academy Awards including Best Picture, the story focuses on army surgeons who develop a lunatic life-style in order to handle every day horrors encountered in Mobile Army Surgical Hospital during the Korean War. Though highly skilled and deeply dedicated, this irreverent mob of madcaps is equally adept at making a shambles of army bureaucracy. Special Features Audio Comme..
Relive your favourite M*A*S*H moments with this three-disc DVD Collector's Edition containing all 24 classic Season One episodes! 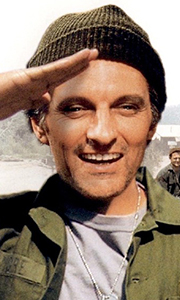 Episodes: M*A*S*H - The Pilot To Market, To Market Requim For A Lightweight Chief Surgeon Who? The Moose Yankee Doodle Doctor Bananas, Crackers And Nuts Cowboy Henry, Please Come Home I Hate A Mystery Germ Warfare Dear Dad Edwina Love Story Tuttle The Ringbanger Sometimes You Hear The Bullet Dear Dad... Aga..
Relive your favorite M*A*S*H moments with this three-disc DVD Collector's Edition containing all 21 classic Season Ten episodes! Episodes: That's Show Biz Identity Crisis Rumour At The Top Give 'Em Hell, Hawkeye Wheelers And Dealers Communication Breakdown Snap Judgment Snappier Judgment 'Twas The Day After Christmas Follies Of The Living - Concerns Of The Dead The Birthday Girls Blood And Guts A Holy Mess The Tooth Shall Set You Fre..
Relive your favourite M*A*S*H moments with this three-disc DVD Collector's Edition containing all 16 classic Season Eleven episodes! Hey, Look Me Over Trick Or Treatment Foreign Affairs The Joker Is Wild Who Knew? Bombshells Settling Debts The Moon Is Not Blue Run For The Money U.N., The Night And The Music Strange Bedfellows Say No More Friends And Enemies Give And Take As Time Goes By Goodbye, Farewell And Amen..
Relive your favourite M*A*S*H moments with this three-disc DVD Collector's Edition containing all 24 classic Season Two Episodes! Divided We Stand Five O'Clock Charlie Radar's Report For The Good Of The Outfit Dr Pierce and Mr Hyde Kim L.I.P. (Local Indigenous Personnel) The Trial of Henry Blake Dear Dad... Three The Sniper Carry On, Hawkeye The Incubator Deal Me Out Hot Lips and Empty Arms Officers Only Henry In Love For Want Of A Boo..
Relive your favorite M*A*S*H moments with this three-disc DVD Collector's Edition containing all 24 classic Season Three Episodes! Episodes: The General Flipped at Dawn Rainbow Bridge Officer of the Day Iron Guts Kelly O.R. Springtime Check-Up Life With Father Alcoholics Unanimous There is Nothing Like a Nurse Adam's Rib A Full Rich Day Mad Dogs and Servicemen Private Charles Lamb Bombed Bulletin Board The Consultant ..
Relive your favourite M*A*S*H moments with this three-disc DVD Collector's Edition containing all 24 classic Season Four episodes! Welcome To Korea Change Of Command It Happened One Night The Late Captain Pierce Hey, Doc The Bus Dear Mildred The Kids Quo Vadis, Captain Chandler? Dear Peggy Of Moose And Men Soldier Of The Month The Gun Mail Call Again The Price Of Tomato Juice Dear Ma Der Tag Hawkeye Some 38th Parallels The Novocaine Mu..
Relive your favourite M*A*S*H moments with this three-disc DVD Collector's Edition containing all 24 classic Season Five episodes! Bug Out Margaret's Engagement Out Of Sight, Out Of Mind Lt. Radar O'Reilly The Nurses The Abduction Of Margaret Houlihan Dear Sigmund Mulcahy's War The Korean Surgeon Hawkeye Get Your Gun The Colonel's Horse Exorcism Hawk's Nightmare The Most Unforgettable Characters 38 Across Ping Pong End R..
Relive your favourite M*A*S*H moments with this three-disc DVD Collector's Edition containing all 24 classic Season Six episodes! Fade In, Fade Out Fallen Idol Last Laugh War Of The Nerves The Winchester Tapes The Light That Failed In Love And War Change Day Images The M*A*S*H Olympics The Grim Reaper Comrades In Arms Part 1 Comrades In Arms Part 2 The Merchant Of Korea The Smell Of Music Patent 4077 Tea And Empathy Your Hit Parad..
Relive your favourite M*A*S*H moments with this three-disc DVD Collector's Edition containing all 25 season Seven episodes! Commander Pierce Peace On Us Lil Our Finest Hour, Part s 1 & 2 The Billfold Syndrome None Like It Hot They Call The Wind Korea Major Ego Baby, It's Cold Outside Point Of View Dear Comrade Out Of Gas An Eye For A Tooth Dear Sis B.J. Papa San Inga The Price The Young And The Restless Hot Lips Is Back In Town C*A*V*..
Relive your favourite M*A*S*H moments with this three-disc DVD Collector's Edition containing all 25 classic Season Eight episodes! Episodes: Too Many Cooks Are You Now, Margaret? Guerilla My Dreams Good-Bye Radar, Part 1 Good-Bye Radar, Part 2 Period Of Adjustment Nurse Doctor Private Finance Mr. And Mrs. Who? The Yalu Brick Road Life Time Dear Uncle Abdul Captain's Outrageous Stars And Stripes Yessir, That's Our Baby Bot..
Relive Your favourite MASH moments with this three-disc DVD Collector's Edition containing all 20 classic Season Nine episodes! The Best Of Enemies Letters Cementing Relationships Father's Day Death Takes A Holiday A War For All Seasons Your Retention, Please Tell It To The Marines Taking The Fifth Operation Friendship No Sweat Depressing News No Laughing Matter Oh, How We Danced Bottoms Up The Red / White Blues Bless You, Hawkeye Bloo.. Complete Seasons 1 To 11 plus the movie..